How is it October 15th already? It seem like yesterday when we had the large tree taken down in our yard. 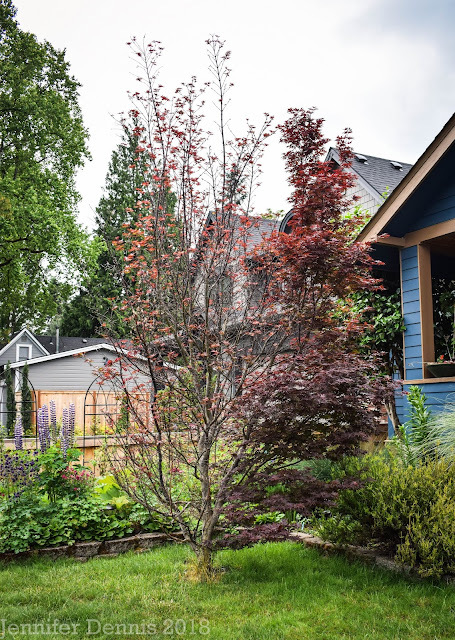 Nevertheless, it's time to join the ranks of Garden Bloggers around the world and share what's blooming in my garden on the 15th of every month. Yesterday started in a perfectly foggy fashion, exposing the spider webs and casting a blue light in the garden. 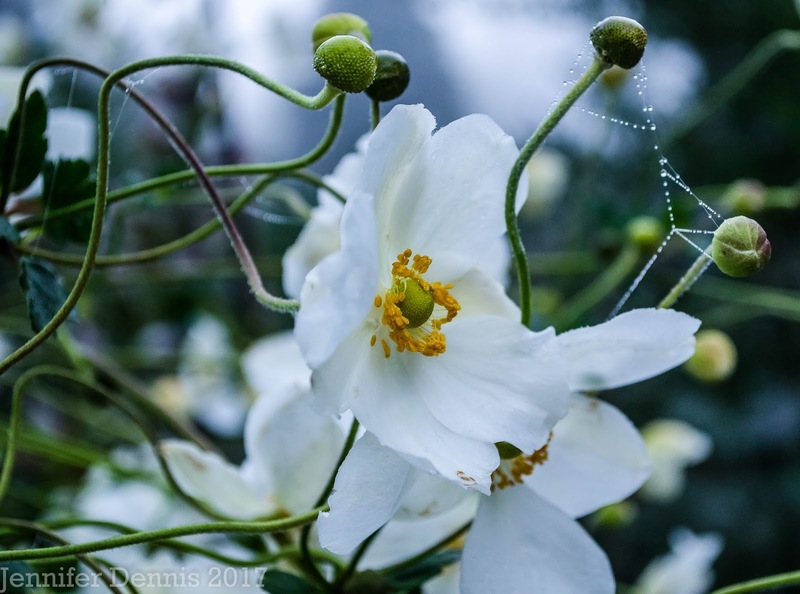 Anemone 'Honorine Jobert' continues to provide profuse blooms in autumn. I love the textured petals and crisp, white color. 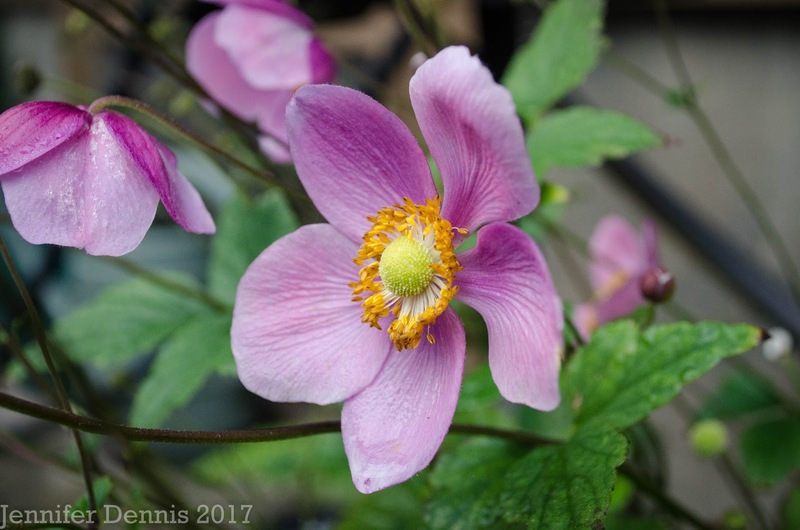 Another anemone that contines to 'charm' in autumn is aptly named 'September Charm'. It's quite a bit shorter than 'Honorine Jobert'. It's not as much of a spreader as 'Honorine Jobert' either. However, I've been able to keep 'Honorine Jobert' contained and I enjoyed the fact that it only took 2 seasons to fill it's placement area. 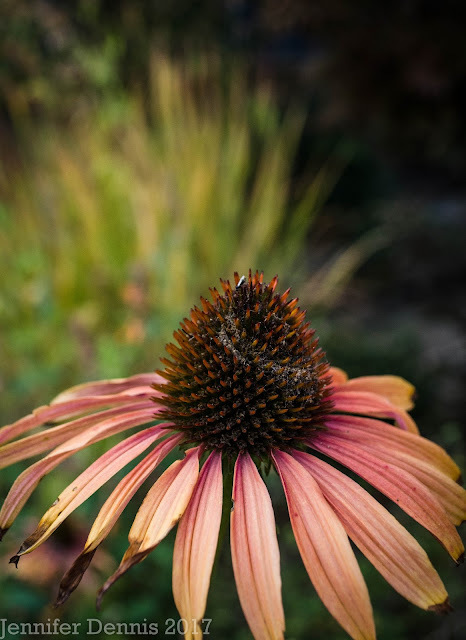 Have I mentioned before, how much I love coneflowers? (LOL) The study structure of echinacea, big fat seed heads and petals that age so gracefully through autum. What's not to love? 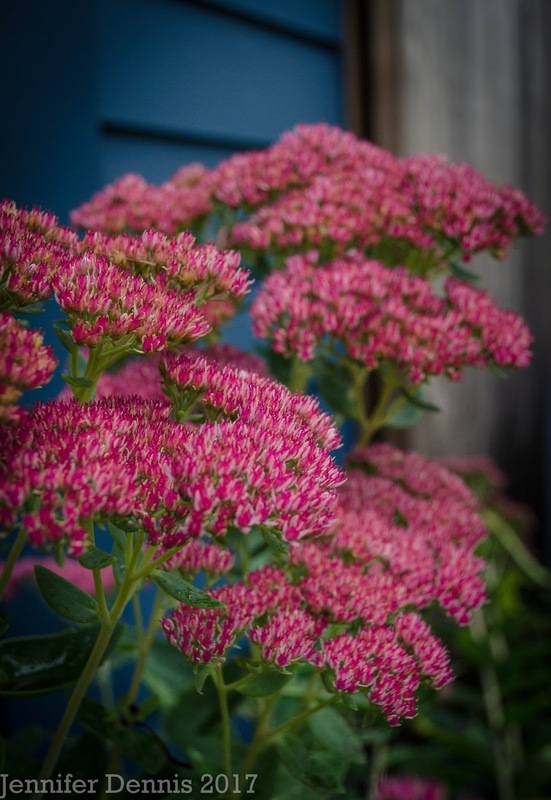 Other blooms that also please, sedums! Pictured below is 'Autum Joy'. 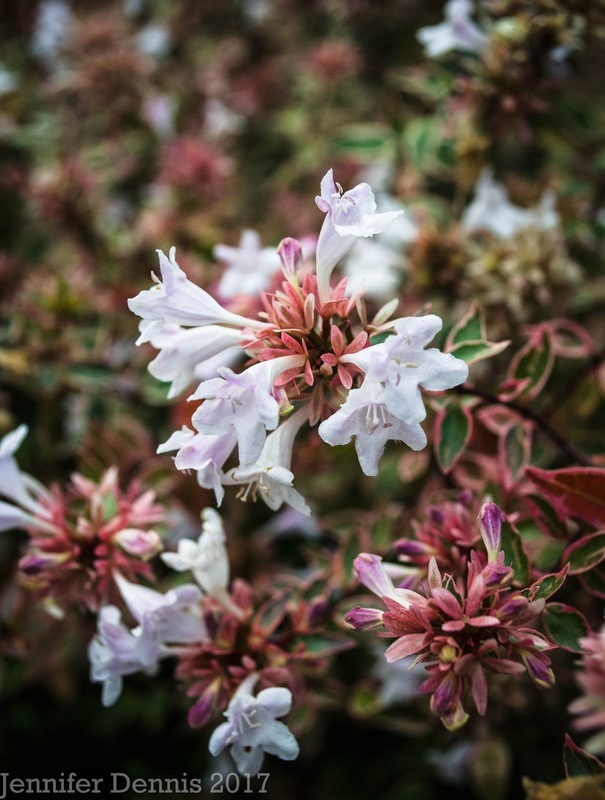 And abelia 'Sunshine Daydream' which has delightful foliage as well. The big stars of my autumn garden are my hardy hibiscus. I have two and this year, due to heat, lack of moisture and then a few big thunderstorms with hail and intense rain....picture worthy blooms have been hard to capture. But....as luck would have it, I got a few. These magnificent blooms are worth the trouble. They are picky about moisture, sunshine (but not too much) and tend to have several branches that break because the blooms are too heavy..but wow..when you get blooms they stop people in their tracks. Below is 'Pink Clouds'. It stands over 5ft tall and produces dinner plate sized blooms. I keep strategizing how I might cram in another hardy hibiscus of this height. And that's a wrap. 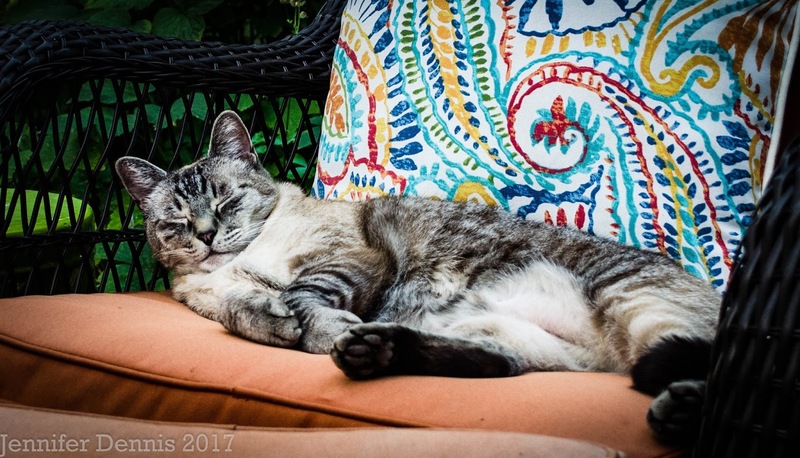 Silver cat and the rest of the crew at the Rainy Day Garden thank you for stopping by. 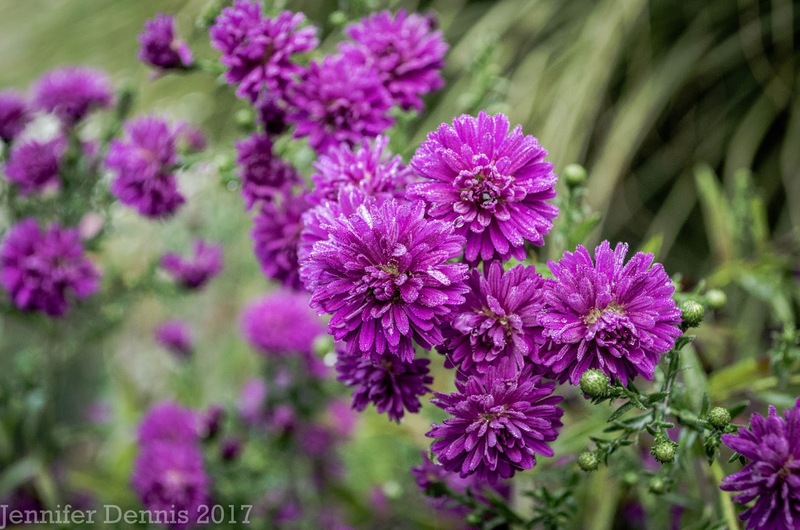 Visit Carol over at May Dreams Garden to see what's blooming around the world. 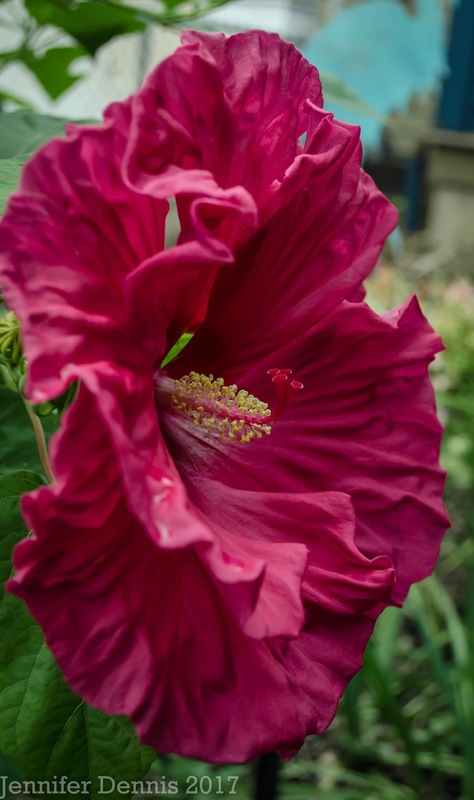 Those hardy Hibiscus are fabulous! I tried a couple when I first moved here, but couldn't get them to bloom before frost. They're late risers in the spring, and they do love a moist spot. Maybe I should try again one more time. 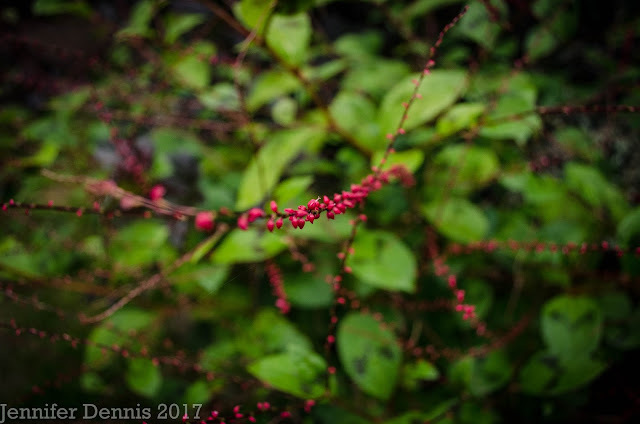 Try a shorter more shrub like one. Jazzberry Jam is much easier than Pink Clouds and the color and bloom size is also very dramatic. If you ever have a little Anemone 'Honorine Jobert' to share I'd love a piece! I will message you~ Would love to be able to give you something after all your lovely gifts to me over the years. As much as I liked seeing your beautiful flowers - especially the anemones, plants I covet! - I adore your Silver cat, who reminds me of my "boys," Max and Ming, now gone. I saw that 'Sunshine Daydream' Abelia recently and have been wondering ever since where in heck I could put another Abelia. The Hibiscus are exceptional too but they want more water than I have to give them. Silver Cat or 'Chubs' to us, is the sweetest boy. I love it when he hangs out with me in the garden. The abelia needs a bit of water, but not too much. The foliage is really something. I couldn't find another sunshine daydream up here and settled for kalidescope. Finger's x'd it's as nice as my first one. Just discovered Abelias at work...charmed by the foliage. That first Hibiscus! WOW! What a glorious collection of fall blooms! 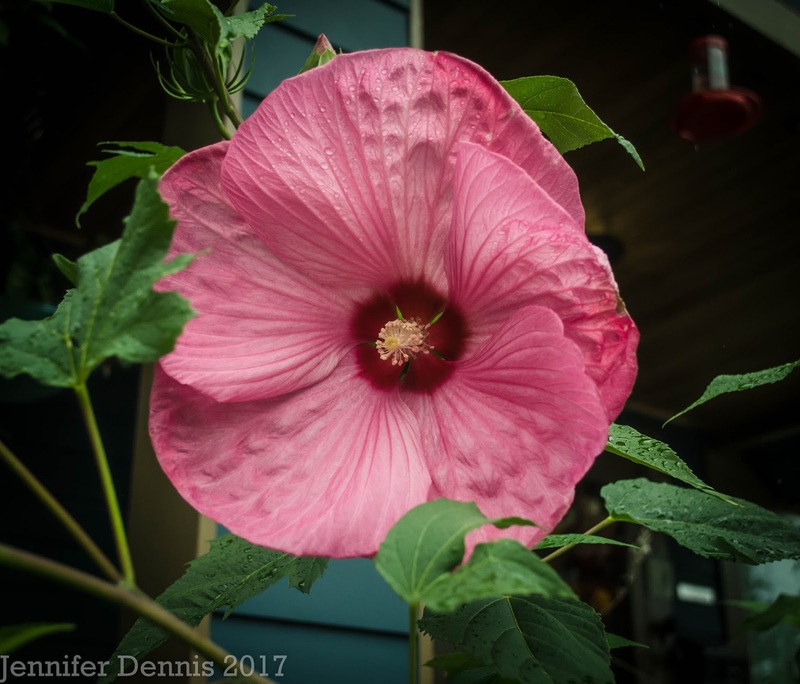 Your hardy hibiscus are truly spectacular. They don't do very well for me and usually peter out after a few seasons. Perhaps one day I'll try again. Hi Peter, they've been semi-difficult for me as well. I bet the problem for you is the lack of real heat in the summer..you've got lot's of moisture! They require some babying from me..probably more than any other plant during the summer.